What would you call an organization that conspires with member businesses to avoid having to pay a fair market-based wage? That’s easy–an illegal monopoly in violation of the Sherman Anti-Trust Act. What about an organization that completely prohibits the payment of ANY wages? I guess that would be fine for a non-profit, or maybe even for an internship, but not for a business raking in tons of money and abusing those same people. Anyway, no could possibly get away with such a policy, right? 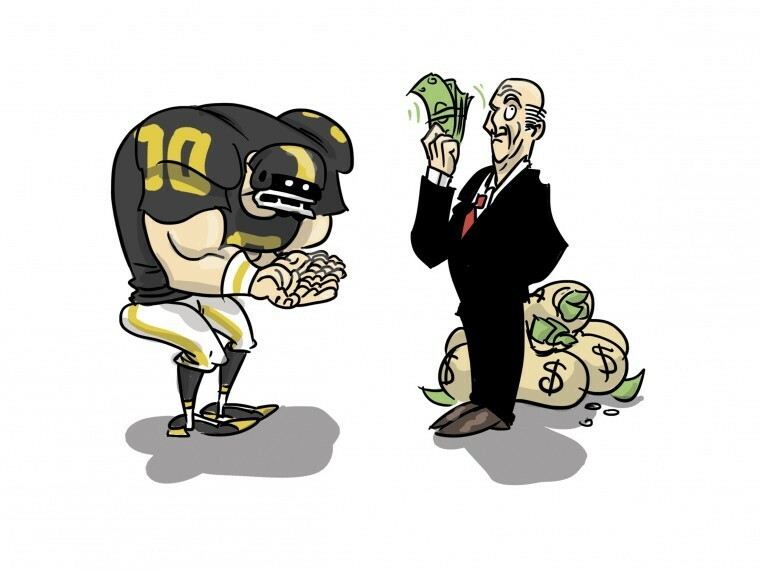 So, how is it that the National Collegiate Athletic Association (NCAA) has managed to ban college athletes from receiving any compensation aside from a tightly controlled amount of scholarship money? How have they managed to do this even while they cheat athletes out of the education they promised by dumbing down their courses or even making up fake courses just to keep them in school? How have they held onto a valuable tax dodge that exempts them from federal taxes on sports-related revenue? As non-profit organizations, NCAA colleges and universities are mostly tax exempt. That includes the huge profits that are generated by many big football and basketball programs. These profits go to support enormous salaries for coaches, bowl game officials, top NCAA executives, athletic department staff, impressive facilities, and so on. Sure, at some schools, some of it goes to support non-revenue sports, but that can’t excuse the massive corruption that pervades revenue sports. From 1973 to 2012, the NCAA even banned schools from offering 4-year scholarships. In 2012, they lifted the ban even though a majority of the schools still wanted to keep it. Schools are now allowed to offer 4-year scholarships, but they are still able to withdraw scholarships after the first year. It is a myth that most athletes can even get a full ride scholarship. Something about this smells bad, and it isn’t the athletes after a hard practice. The big NCAA schools just don’t want to share their enormous income on the athletes themselves and justify this by saying it will kill amateur sports, or favor some schools over others. 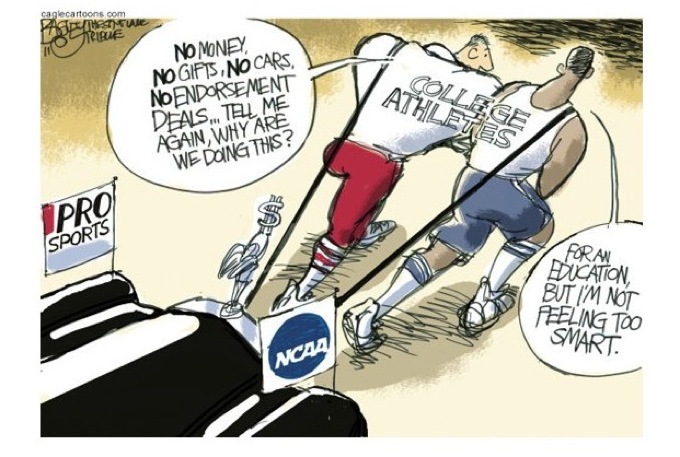 Hmmm, if they are implying that the NCAA somehow ensures that all schools are equal, they are feeding us a load of BS. There will always be inequality in college sports because alumni and other donors can give as much money to their school as they want in order to make their school more attractive to students and athletes. 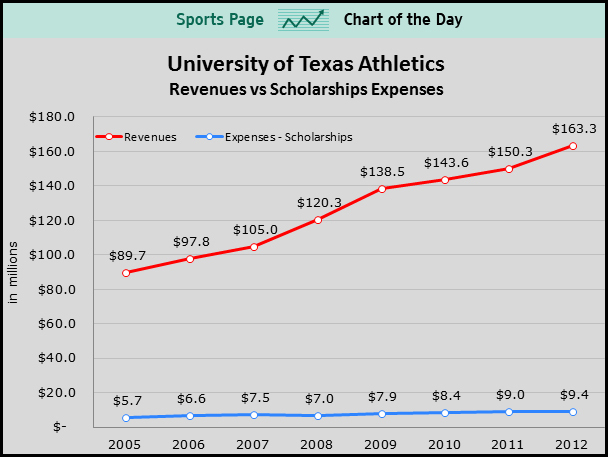 Some schools already have an enormous advantage and sports revenue follows the winning teams. After pretending for years that the Olympics was limited to amateurs, the rules were finally changed to allow paid professional athletes to participate. We always knew that Russia, China, and plenty of other countries effectively paid their athletes to pursue an “amateur” sport. It just took a while to finally admit it and stop the ban on money for athletes. The Olympics didn’t come crashing down. 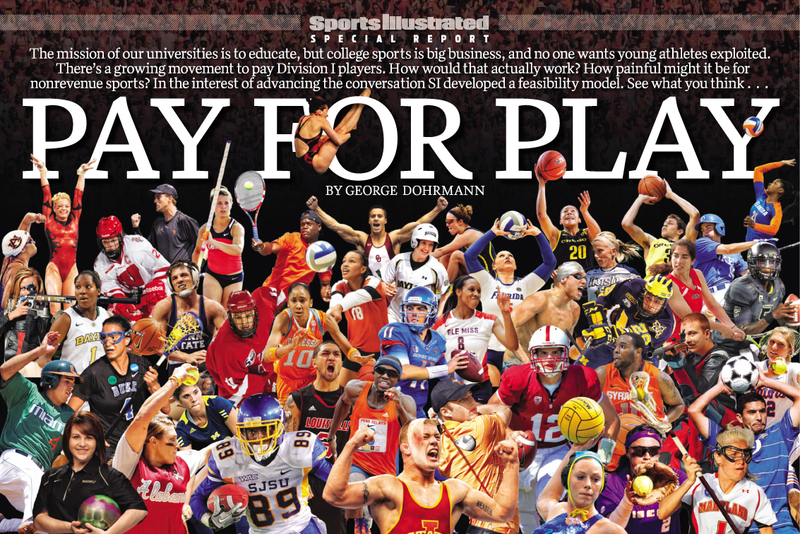 As for NCAA athletes, the lucky ones effectively get paid too–by those parents who are willing and able to support them all the way to the pros. Nobody stops individuals or businesses from paying other college students. You can get a scholarship or grant for just about anything today. If you are smart, you can even raise money on your own or sell your virginity for tuition, but not if you are an athlete at an NCAA school. It makes no sense. Actually, it does. The pretense of amateurism allows schools to get out of paying taxes on billions of dollars of income. Some say that athletes will never be paid because, if they were paid by the schools, they would have to be considered employees, which would cause the schools to be subject to all kinds of tax headaches. Athletic departments would lose its tax exemption under Internal Revenue Code Section 501(c)(3). Currently, athletic departments (which are generally a separate legal entity from the university), athletic foundations/booster clubs, and bowl games all enjoy tax exempt status because they “promote amateur athletics,” which is an exempt purpose under the Code. If college athletes were compensated and found to be employees, this tax exempt status would most likely be revoked. Moreover, they would likely lose 25-50% of donations since donors would no longer being able to make tax-deductible contributions. No only that, but large donors would then have to pay a gift tax on donations over $13,000. Even if they didn’t lose their tax-exempt status, they might still have to pay tax on income from athletics if they are ruled to be unrelated to the primary activity of the school. Congress created the Unrelated Business Income Tax (UBIT) so that income from regularly carried on business activities that do not further the organization’s exempt purposes would be taxed as though earned by a for profit corporation. Colleges and universities, which were established to provide an education, are getting a free ride on the UBIT right now, but this could change. Maybe this whole issue is nothing more than another unintended byproduct of our broken system of taxation that could be easily fixed by tax reform. Another reason to simplify the tax code. We often think of sports as a way for poor kids to make it. But preventing them from getting paid at all actually undermines this opportunity. The fact is, families who are serious about sports probably end up paying more out of pocket than they could ever hope to get back in a sports scholarship. That’s right. It’s expensive to play amateur sports. Many school districts don’t even have public sports programs at the elementary or middle school level, so kids have to pay to join club sports teams to even have a chance. If they are good, their families have to pay for uniforms, equipment, field time, tournament fees, and all the other stuff that comes along with being on a youth sports team. A supportive community may help to raise the funds for poor kids, but such opportunities are not guaranteed. It can cost $1,500 to $5,000 dollars per year, depending on the sport, just to get the chance to play at a competitive youth level. Some say it is even higher–like $9,000 to $12,000. 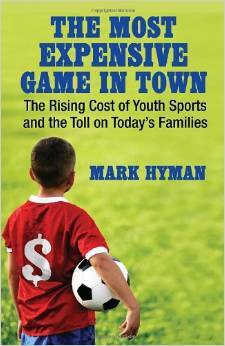 The youth sports industry is estimated to be worth $5 billion. These teams are mostly where college athletes are now recruited. The limited availability of scholarships and limits on payments to athletes probably benefits wealthy families who can afford private teams and coaching that can help them get to the 10,000 hours of practice that some say is vital to the development of an elite athlete. But it doesn’t provide a level playing field for everyone. Now, if colleges would help to fund the costs of promising amateur high school athletes, instead of offering empty promises, that would help to level the playing field. Some lawsuits have challenged NCAA compensation rules. As the result of lawsuits that ruled the NCAA has violated anti-trust law, athletes are now allowed to receive a small share of profits from their school’s use of their likenesses, but it is capped at $2,000 to $5,000, depending on the school. It’s a small step, but still a pittance that does nothing to change the face of college athletics. As parents, we already know we have to pay to have our kids play, but it is a burden we would gladly share with others who are more than willing to help. Our kids are already willing to play their hearts out for nothing but the opportunity to have fun and maybe, if they are the best of the best, to make it to the pros. But doesn’t mean we have to let the big colleges take advantage of them and make their journey even harder. It’s time to get back to this country’s free market roots. Pay to play is the way to go, baby! This entry was posted in Sports, Taxes and tagged amateur athletics, anti-trust lawsuits, college sports, NCAA, NCAA compensation rules, pay for play, pay to play on January 30, 2015 by EarthVisitor.